I’ve used the clear crackle, but this gold crackle rocks! Thanks for bringing this to our attention for our creative enjoyment. I love how you compare the products for us, thanks! I think I prefer the finer texture of the Prima. Perfect for leaves! The crackle on the leaf is just perfect. Must have! Another beautiful card. Wish I had all the supplies but budget is cramped right now. You never cease to amaze me Sandy! Stunning card! Hi, had to rewatch all the lessons!! I forgot that you gave us a comparison of the two gold embossing powders and the Delicata with clear embossing powder. Shiny stuff! Love this whole week. Loving all of your tips and tricks, Sandy! Thanks for sharing and showing all of the techniques and products! Love the shiny gold leaf card today! I am grateful for you! Love the card! Wow! Such different crackles! Thanks for sharing! those crackle products are all so different. thanks for showing! When you said SUPER shiney, you meant SUUPPER shiney! I love all of the gold in today’s class! It was great to see the difference between the Delicata clear embossed stamping and the embossing with the other powders. I am wondering if you can possibly show us a comparison between the Delicata ink and other gold inks. I have the Tsukineko pad and refill. Like you, I am a believer in buying quality products. But, I also like to spend my money on new things, not something I feel like I already have. That being said, if there is a big enough difference, I am all for buying a replacement. Thank you, Sandy! This class was such a wonderful surprise! I love the crackle on the leaves. The shine is amazing! Thanks Sandy for the wonderful inspiration you are sharing to pull out all our gold! Great video! This is reminding me to look at the gold things I have and get them out… like the Delicata Gold pad I have not even opened yet! Wow- this is gorgeous! Love the crackle! WOW!! This is so much fun!!! I LOVE the look of the crackle!! I’ve not been a fan of crackle anything before, but this card has changed my mind. Absolutely stunning! I love how the background & stenciled side came out. That added the right amount of focus. Nice card. Looking forward to the rest of the class. First two days wonderful. I love this beautiful card! Thanks for showing the crackle technique. Love it! 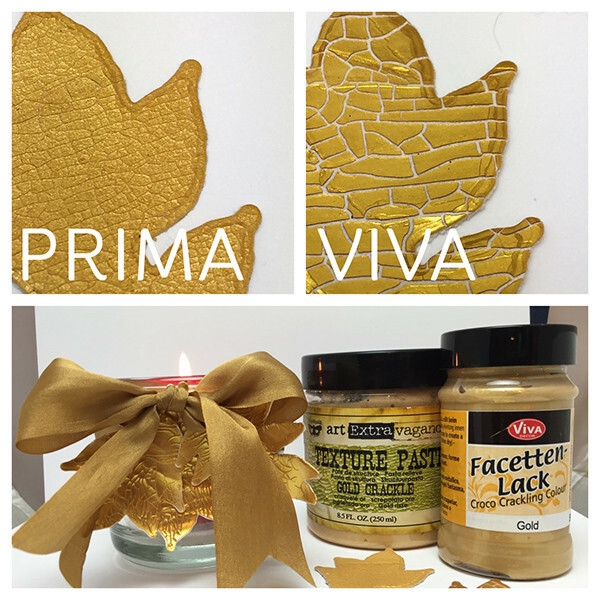 Such an amazing gold paste! Love the leaves! Love the gold shimmery leaves, such a beautiful card. Thanks for tip about the craftboard and crackle base coat too! This is the most beautiful card ever! I added so much to my wish list at EH – I just wish they included a cart park so that I could fill my cart with paid product each day, then have it shipped in ONE shipment at the end of the week. I guess that is just too much sugar for a nickel as my Mom said. Shipping is a cost I accept happily but sure wish I could combine orders since I see stuff with each of your posts that I HAVE to get. LOL. just add it to a wish list that gets reduced due to others paying for product before I do. A GOFORTHEGoLD parking lot specially for us is all I want for Christmas since I already have my 2 front teeth. Oh, no another shopping list for me – love the shiny card! Thanks for all the wonderful videos you do. Color Shine gold is like a shimmery waterbased paint…very small amounts of sparkle do come off on one’s hands if rubbed. Love Day 1 and 2 so far! Thanks for the great ideas! I am really liking this Go For The Gold Class Series. Thanks! Wow Sandy! Day two card is absolutely gorgeous! Can’t wait to try these techniques! I wonder what would happen if the Croco was applied with a sponge and stippled on…..hmmm. Another great video! Love all this goldness! My order list is growing! Thanks for the tips and love the comparisons…you are a great resource. Stunning card, Sandy! Loving this series! Loving my classes Sandy.Thank you for showing the with and wirhout.See you tomorrow , or should I say see you soon on Periscope , LOL. Hmmm, I tried to get to the sticky post to link up and it gave me the dreaded 404 code 🙁 Anyways, loving the series so far Sandy!!! Ack—-will get it fixed, sorry! I’ve seen these products in the art store but didn’t know what they were or how they were used. So glad to see a project using this medium! I don’t usually use much gold but love this technique! I do love Delicata……best gold ink out there! Thanks for all the inspiration! This card is fabulous! I really appreciate you showing the comparisons and different techniques. Thank you for sharing!! I never made a shinny card like that before either…I love it! great review on the products too! I love the composition of this card. I placed a substantial order with Ellen Hutson yesterday. Even though my credit card is going to go into the Witness protection program if I don’t stop buying things, I can already see from this post that there are additional things I’m going to want. Must. Win. Lottery. Love your video and how you show us different techniques. Beautiful card.